Arsenal lost on penalties after a 1-1 draw with Atletico Madrid in normal time, but what did the game tell us about Unai Emery's new era? Teenager Emile Smith Rowe cancelled out Luciano Vietto's opener with a stunning strike from 20 yards out, but Arsenal could not break Atletico down after that and succumbed to a 3-1 penalty shootout defeat. From Smith Rowe's starring performance to Arsenal's intensity under Emery, here are five talking points from the game. 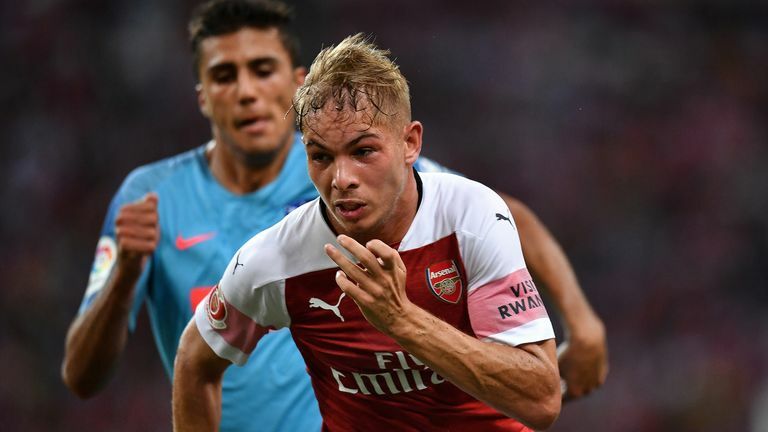 Smith Rowe was an unfamiliar inclusion in Arsenal's starting line-up but the 17-year-old has impressed Emery in pre-season and he certainly made the most of his chance against Atletico. His goal, brilliantly curled home from outside the box, was the highlight of an encouraging performance. The academy graduate was deployed in central midfield along with Matteo Guendouzi and Aaron Ramsey and he looked composed from the start. He showed impressive skill as he wriggled away from two blue shirts in the 17th minute, and there were a number of other occasions when he showed a willingness to take players on and carry the ball forward. His goal came after one such surging run shortly after half-time, and he was even trusted to take corners, on one occasion picking out the unmarked Pierre-Emerick Aubameyang for a volley at the far post. He was one of eight players substituted after an hour, but Arsenal fans will be eager to see more of him as their pre-season continues. Aaron Ramsey's Arsenal future is uncertain as he stalls on a new contract with only a year remaining on his current deal, but Unai Emery has already described him as an important part of his plans and used his first major friendly of pre-season to hand the midfielder the captain's armband. Emery hopes to convince Ramsey to commit his future to Arsenal by placing him at the centre of his new era, and there were glimpses of why he is valued so highly on Thursday afternoon. Ramsey was typically industrious in midfield, pressing Atletico high up the pitch in the first half and sending Alexandre Lacazette through on goal with one clever first-time pass. It remains to be seen whether Ramsey will be given the captaincy on the permanent basis, but Per Mertesacker's retirement has opened the door and the early evidence suggests Emery views him as a contender. Arsenal supporters are intrigued to see how Emery decides to use Aubameyang and Lacazette after both players shone in the final weeks of last season, and the early indications suggest he sees Aubameyang lining up on the left with Lacazette spearheading the attack. Their pace and movement caused Atletico problems in the first half, with Aubameyang dragging two efforts wide and Lacazette forcing three saves from Jan Oblak, and while Aubameyang spent most of the game stationed on the flank, he was also encouraged to swap positions with Lacazette and the impressive Reiss Nelson. That flexibility gives Emery plenty of options. Guendouzi was handed his first start as an Arsenal player having appeared from the bench in the meeting with Boreham Wood earlier this month. The 19-year-old, an £8m signing from French side Lorient, was deployed at the base of Emery's midfield, where he was charged with protecting the back four and building attacks from deep. He started confidently, showing ambition with his passing and even attempting a long-range shot after eluding his marker early on, but there were difficult moments too. He nearly lost possession on the edge of his own box before half-time and he found himself in trouble again after the break when Kevin Gameiro robbed him and set up a scoring chance. Overall, though, Emery will be encouraged by what he saw. Guendouzi is unlikely to feature prominently this season, with the more-experienced Lucas Torreira expected to start in the holding role once he has returned from his post-World Cup holiday, but his potential is clear. Emery is known for his high-intensity playing style and there were signs that he is already getting his message across against Atletico. Lacazette, Aubameyang and Ramsey could all be seen pressing Atletico's defenders high up the pitch in the first half, with Arsenal aiming to pounce on their opponents' mistakes. The game became disjointed with all the changes in the second half and Arsenal are still very much a work in progress, but Emery's influence is already apparent. The preparations continue against Paris Saint-Germain on Saturday.